The Shirley Temple Double Peony is a great choice for starting a spring cut flower garden. Grown in one gallon containers, this potted peony is a large plant ready for planting. Large fragrant white double blossoms show just a hint of rose pink in the center and along base of petals. 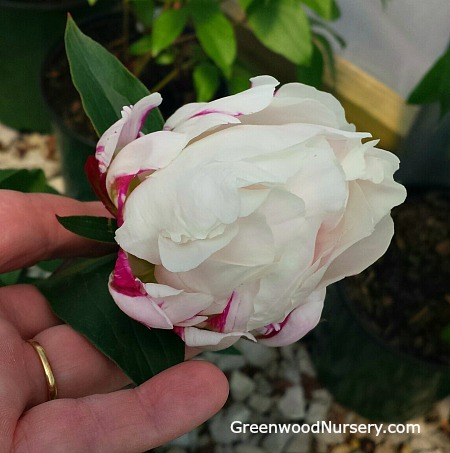 Growing up to 24 inches tall, the Shirley Temple Paeonia spreads up to 3 feet wide. Cut flowers abound in mid spring with this white flowering perennial plant. Shirley Temple Peony is grown in a one gallon container. Orders shipping to CA and AZ will be bare rooted before being prepped for shipping.